Oltre – the name means ‘beyond limit’ – is a monocoque design made from ultra-high density carbon composite (unidirectional UMS40 for all the materials boffins) which makes this frame very stiff. Epoxy resin and nano-powder (yes nano-powder) are added to the mix to reduce the possibility of micro fractures developing. Carbon Nano Tube (CNT) technology increases the fracture toughness by 49% over standard resin and is 20% higher than their existing nano-technology. The Oltre also features Bianchi’s new X-TeX design inside the head tube area that is an internal mould shaping of the inner carbon walls into a grid-like structure with criss-crossing raised ridges that increases the stiffness and impact resistance without increasing the weight of the frame. Bianchi designers have also come up with a wrinkle-free molding process (WMP) to reduce weight. It is the quickest and easiest way to compensate for that is to increase the thickness of the laminate. 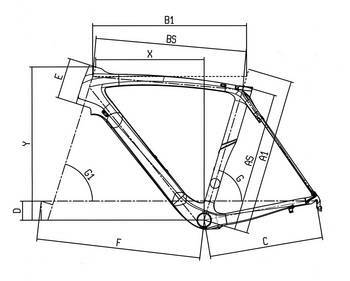 Bianchi is particular about exactly how they build frames. By tuning the phases and the parameters of the manufacturing process Bianchi has increased the thickness of the laminate which keeps the frame weight down. The new Bianchi Oltre XR.2 was created for the rider who will settle for nothing but the very best. This is the bike raced by Vacansoleil-DCM in the Gran Tours. Bianchi's proprietary blend of X-Tex, Nano-Tube, WMP, and UTSS selectively stiffens and strengthens our most advanced carbon frame. The new XR carbon formulation sheds 30 grams and strengthens the frame by 20%. The Oltre cheats the wind with internal cable routing and proven aerodynamic design features found at the head tube, fork, aero seatpost, and around the rear wheel seat tube cut-out. BB30 technology rapidly transfers power to the rear wheel while the oversize bottom bearing in our well-sculpted head tube keeps steering intuitive and on-mark. Oltre literally means beyond. The Oltre XR.2 will take you beyond your wildest dreams. Bicycle Parts include: Bianchi HoC Oltre XR.2 (Sloping Top Tube) Carbon Frame and Fork with a Texas Cyclesport custom Build Kit: Pick your parts from Campagnolo EPS Groupsets 11 speed, Integrated Headset, Choice of: Handlebars, Handlebar Tape, Stem, Saddle, Wheelset, Butyl Road Tubes, Tires and Seatpost.